This afternoon, as the kid from next door sat on our front steps playing Mine Craft on his iPod, my grandson stood nearby, tracking the flight of our resident red-tailed hawk. Suddenly the hawk loosed a feather, and my grandson watched as it caught on a tree branch, and then let go, and finally landed in his waiting hand. He ran into the house shouting that he caught a hawk’s feather, wanting to share this miracle with the world. Two kids, roughly the same age. One is home schooled. Easy guess, which one. So, you could say that my grandson, Lex, received a message from his totem animal. Such is the spirit mystery of the natural world. While the rest of the family is planning and preparing their vegetable garden on the more fertile side of the property, I have commandeered the side of the yard where the pervasive roots of the ancient maple that was destroyed during the Snowpacalypse two winters ago make it impossible to till soil or grow anything. Poppies have already spouted in the main stump container, and my mini calla lilies that spent the winter in the cellar are generating buds under the soil of the other. I emptied the shed of all of the big pots and have begun a kind of container garden that will include herbs, flowers, and all kinds of tomatoes. And garlic. Lots of garlic. 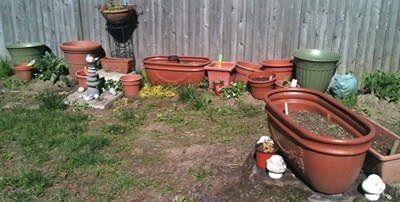 The pots are lined up along the nearby fence, which gets sun all afternoon. The soil there is not great, but hostas and wild violets seem to be happy there. I planted three sunflower seedlings and some Creeping Jenny and have lined up the pots, some of which already contain herb and flower seedlings. It is not yet the configuration I want; I will have a better sense of the aesthetics as the bloomings emerge. In a month or so, it will be fun to compare this photo with one that boasts a more colorful and thriving container garden. There will be some re-arranging and adding to. My projects, be they gardening or knitting or sewing always seem to be continuous ones until something out of my control puts an end to them. Sort of like everything in my life. Circles. Now, there’s a metaphor. 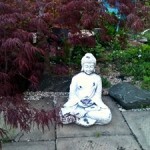 I’ve been looking for some kind of statuary around which to focus the container garden. 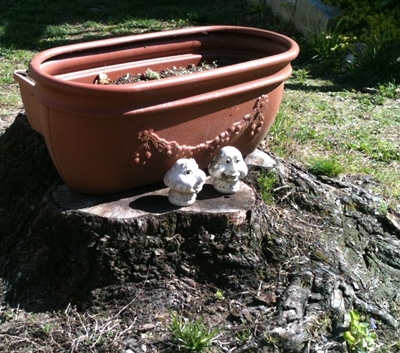 For the moment, I’m using a cairn that I found (oddly enough) at Home Goods. 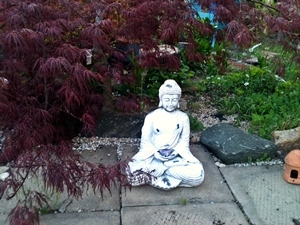 We already have a Buddha in a little meditation spot in a shady part of the yard. 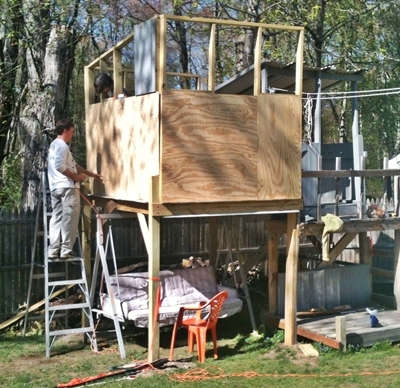 In the meanwhile, the family continues work on the addition to Lex’s “fort.” (Original structure is on the right of the addition.) It’s going to be a fun summer around here. This entry was posted in family, family fun, food, gardening and tagged container gardening by Elaine. Bookmark the permalink.